SCOTTISH Football Association chief executive Stewart Regan is relaxed about Gordon Strachan’s contract situation. Regan and Strachan plan to discuss the Scotland manager’s future after the end of the Euro 2016 qualifying campaign later this year. Strachan is not contracted to Scotland for the World Cup qualifying campaign against England, Slovakia, Slovenia, Lithuania and Malta. 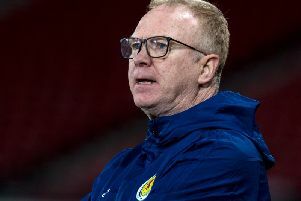 That could alert clubs impressed with the way the former Celtic boss has progressed Scotland and put them in a position to challenge Poland and Germany for an automatic slot for France. However, Regan said: “Gordon has made it very clear that he loves his job. It suits him, it suits his lifestyle. Whilst Gordon Strachan is winning matches for Scotland and developing the country like he has done, it becomes difficult to do anything other than support him. Regan, who welcomed a new intake of SFA Performance School pupils to Hampden, added: “Gordon’s got a contract in place. That contract is all about taking Scotland to a major final. “We are part way through our campaign and are in a very good place going into our double-header against Georgia and Germany next month. “Gordon and I had a chat about it and we will sit down after the Euro qualification phase and discuss his future.